Welcome to the research website of Erin Leigh MacMillan (PhD), Philips Magnetic Resonance Clinical Scientist for the UBC MRI Research Centre and Simon Fraser University’s ImageTech Lab. NEWS: UBC and SFU will each receive a new Philips Ingenia CX 3.0T system by early 2018!! My research focuses on performing biochemical experiments on living people – even myself – no beakers involved! Using an MRI scanner we can not only take pictures of the human body non-invasively (I’ve been scanned nearly 100 times), we can also define a region of interest and measure the levels of several molecules in that region. In the above picture, these molecules are labeled on the spectrum. These molecules can tell us about the health of the brain, specifically the integrity of different types of brain cells (NAA and mI), communication between brain cells (Glu, Gln, GABA), energy storage (Cr, PCr, lactate) and cell membrane synthesis (PC, GPC). 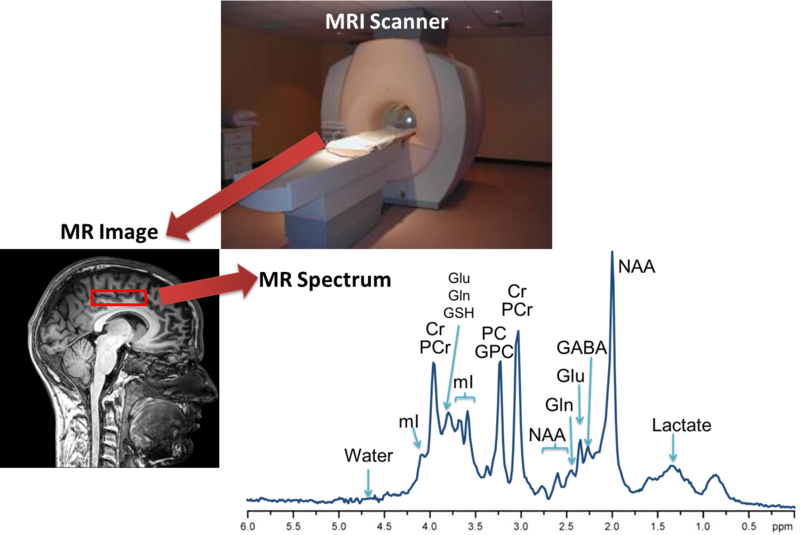 Magnetic resonance spectroscopy (the name given to NMR spectroscopy when performed on living beings) has been used to study the human body for more than 30 years and continues to provide biochemical information about disease processes not available with any other technique. OK beakers are sometimes involved, when we test new techniques, or at the beer garden.